Tag Archives for " Penelope Trunk "
The title of this post might be one of the most important questions that entrepreneurs never ask – or at least fail to consider the answer to frequently enough. Truly understanding the answer to this question may define the difference between a feeling of success or failure in business – regardless of how well a business seems to do outwardly. 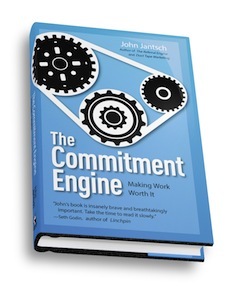 I’ve written an entire book on this notion called The Commitment Engine – Making Work Worth It. (Oct 2012) The book is a study in how entrepreneurs find and commit to work worth doing and then how they build an organization with a culture based on work worth doing and finally how they create a community that believes in and wants to be a part of the work worth doing. What Makes the Work You Do Worth It? It’s such an interesting and at times arresting question. As I’ve begun to pose it to more and more individuals I’ve come to appreciate the distinction between those that know it immediately, without hesitation, and those that ask to get back to me or what my deadline is. Here’s what I’ve learned. If you don’t know the answer to this question off the top of your head, you’ve got some work to do. I don’t say that as a form of judgment, it’s just that I’ve become convinced that it’s nearly impossible to be fully alive in this world without a commitment to some purpose that makes the work you do worth it. And the funny thing about this idea is that it doesn’t matter what that is, as long as there’s a strong commitment. I’ve interviewed people that gain a great deal of success serving a higher purpose that involves changing lives for the better and I’ve also spoken with those that understand their work and the money it brings simply serves a means to a different end that fulfills them. There’s no right answer and that may be part of the challenge because we immediately think a term like “higher purpose” should point us in a spiritual direction, but it doesn’t need to. The only thing that matters is that we understand and connect to why we do what we do – end of story. I get paid. That’s what makes the work I do worth it. Because I already know how I like to spend my time. I don’t need to get paid to do stuff I love. I’d do it anyway. But I need to feed my family. So I adjust the stuff I love to do so that I can get paid for it. For example, I would probably lock myself in a room and write my memoir, but I’m scared that I wouldn’t earn enough money while I was doing it. So i write almost a memoir via my blog, and I get paid really well for it. And I love speaking, and I’d speak to large groups for free because it’s so fun. But I get paid $10K a speech if I talk about Generation Y, so I do that, even though, to be honest, I’m totally sick of talking about Generation Y and they are the most conservative, non-risktaking generation to come along since World War I and why can’t we stop doing speeches about them already? So I think it’s totally disingenuous for anyone to answer this question with anything but “I get paid”. Because the difference between what we do for work and what we do because we love it is that we get paid. No one gets to do 100% of what they love for work. That’s not how the world works. Those of us who are happiest in our work are getting paid to do something we really enjoy. A few key elements make the work I do worth it. First is a deep sense of alignment. I wake up every morning excited to create experiences and solutions that are organic extensions of who I am, what I care about and what people want, need and value. I feel like the work I do matters. To me and to the people I serve. And it lights me up along the way. Second is the pursuit of craft and mastery. As a an author, entrepreneur, artist and web-producer, I spend much of my days pursuing craft and mastery. I geek out over language, twists of phrases, metaphors and storytelling that rises to the level of transcendence engine. I love the challenge of creating immersive experiences for clients, readers and customers that leave them in some way changed. Striving to solve complex problems and teaching people how to do the same makes me giddy. Whether I ever achieve that elusive state of mastery isn’t so much the point, but the quest, the journey, the voracious seeking after the craft is something that pulls me to do more of what I do. Third, it’s about the people. I’ve launched, built and sold a few companies and am current building a number of global digital tribes and ventures. People often ask what the best part of entrepreneurship is. Is it the money? The freedom? The glory? It’s not any of those, most of which take an insane amount of work and years to come if they ever do. The real magic lies the opportunity to hand pick the people you surround yourself with and cultivate a culture of joy, respect, service, delight, connection and impact. You get to build a hive of people you can’t get enough of, and that makes a huge difference in the way you experience each day. Last thing, family is the heartbeat of everything. I’ve worked to build my career in a way allows me to be deeply present in the lives of my wife and daughter and also take care of myself (still a work in progress, lol). Because, it’s not enough to be physically there, but checked out or so sick and burnt that I’m not really there. I want to be physically, emotionally and spiritually present, which means creating time for the self-care needed to build this foundation. This list is by no means all-inclusive, but it contains the big rocks for me, the things that make the work I do worth it.